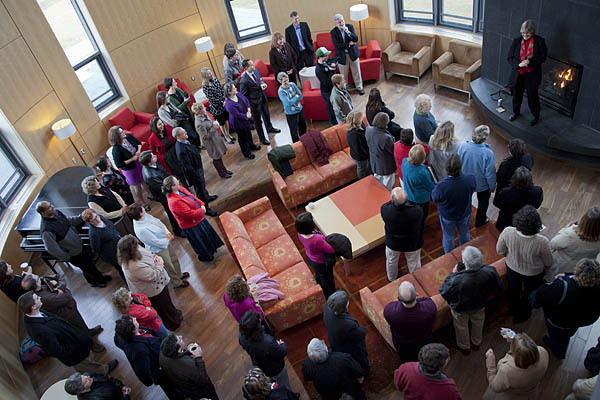 Bates President-elect Clayton Spencer, standing on the slate hearth at right, talks to faculty and staff during an informal meet-and-greet on Dec. 5. Learn more about President-elect Clayton Spencer. The answer, of course, was an emphatic “yes” — more evidence of the good feelings that have accompanied the Dec. 4 announcement that Spencer, currently vice president for policy at Harvard, will assume the role of Bates’ eighth president in July. The Monday morning meet-and-greet was an informal opportunity for staff and faculty to shake Spencer’s hand and look her in the eye — something the president-elect took in stride considering the 100-plus people who jammed the lounge for the opportunity. Full of gratitude for the college’s open-armed welcome, and praise for the classy way Bates introduced her Sunday as its next leader, Spencer took a couple of questions during her informal address from the hearth. Not surprisingly after a year in which Bates and peer schools have been criticized, if not quite fairly, for their costs of attendance, one questioner asked for Spencer’s thoughts about increasing access and affordability. “It’s a really simple but really expensive problem,” she said: The college must increase the amount of money it raises for financial aid. “Fund-raising will be a fun dimension of the job for me.” She added, “Bates is a great product to sell” to prospective donors. Another questioner, perhaps thinking of the college’s recent symposium about college costs, wondered if colleges like Bates are operating with a sustainable financial model–high sticker prices with steep discounts. Spencer, reputed to be very smart and very nice about it, responded with a capsule analysis of decades’ worth of American economic trends leading to the conclusion that, indeed, that model isn’t sustainable without some changes. The Rev. Bill Blaine-Wallace, Bates’ multifaith chaplain, took a minute at the gathering to chat with a writer about the president-elect. “A native North Carolinian with two theology degrees — what more can I say?” laughed Blaine-Wallace, who is a native North Carolinian with two theology degrees.